In more news from the ever-wonderful Gamasutra, a recent interview with Charles Bellfield, Capcom's VP/marketing, has provided some intriguing information on the whereabouts of the staff of now-defunct Clover Studios (makers of the fabulously overlooked Okami). "Some of the team that worked on Clover titles are now helping Takeuchi-san on Resident Evil 5, helping Inafune-san on a new title for the Wii," Bellfield told writer Kyle Orland. "So I think it's very much the skill set still stays in the company when those individuals stay and, unfortunately, three individuals chose to leave." Wonder what the former Clover folks are working on for their new bosses? 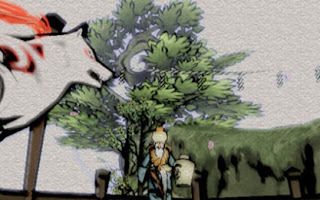 Could it be the Wii-enabled Okami that has been rumored for a while? Bellfield did say they were working on a "new" game, but that doesn't always mean "brand new." Guess we'll see!